Finding yourself on the farm. 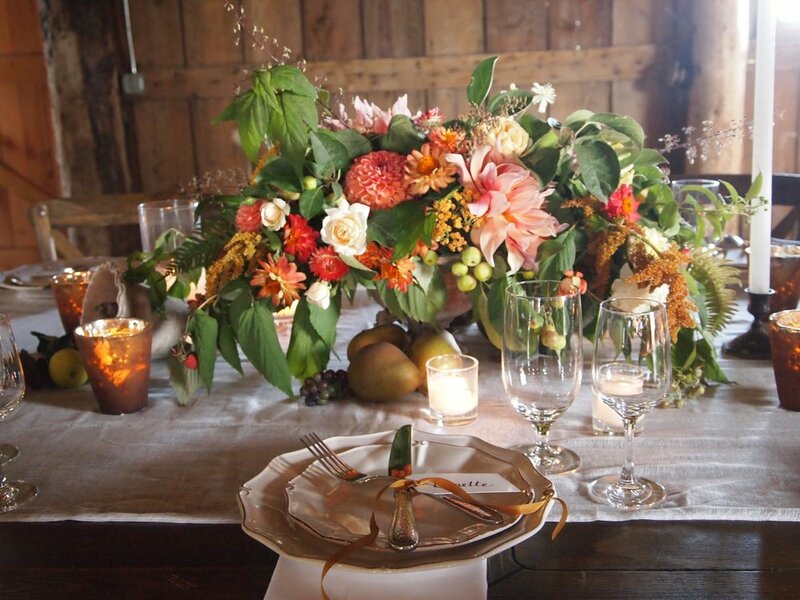 We met on the first day of the Floret Design Intensive at the Historic barn of the A.J. Johnson Farm. It was what barn dreams are made of and I will be fantasizing about this place for years to come. The barn was built in 1906 and apparently nearly lying on the ground when the restoration process began. Today, the barn is used as the creative space for Floret’s workshops. It was such an inviting and inspiring space. As we arrived, we found amazing swag bags waiting for us, with so many thoughtful touches including a lovely floret apron, a Rifle paper notebook, our Floret Flower "bible" and some of Floret’s heirloom seeds that I smuggled home with me and cannot wait to grow to next year! Once we got acquainted with each other and team Floret, we took some time to set our intention for the workshop and share it openly with the group. It was a memorable and emotional experience. We laughed and cried. We opened our hearts to near strangers and whispered our wishes out into the rafters of the barn. I challenged myself to step out of my comfort zone with design and let go of all the demands and expectations I put on myself. I had no idea what that would look or feel like. Or how giving myself that permission would allow me to fully experience all the other life changing experience this workshop would offer. From the barn, we headed over to the flower farm. It was breathtaking. As we took our first steps into the hoop houses and fields, the beauty and serenity of this place quieted all the worries, never ending list of to-dos and ideas that are normally clamoring through my thoughts. The simplicity of it all was magical and I will never forget the feeling of being there. Erin showed us around her workshop, the hoop houses, the fields and then we were set out to harvest all we could. The flowers were in such abundance, I could hardly process it all at once! I headed straight to the rose bushes. The scent was intoxicating. It reminded me of the wild Alberta rose bushes that I remember as a child growing up in the Peace Country. At first I found myself afraid to cut the plants. It felt a little odd to take away from this majestic beauty, a very different feeling from pulling cut flowers from a box. But once I got started, it was fascinating to see how much you could cut, and how much still remained! It was incredible to stand where these coveted blooms grow. The hot sun, the colors, the scents, it was sensory overload and my passion for flowers was completely reawakened! When we finished harvesting, we loaded our buckets into that old iconic farm truck! The truck quickly stole the show, and we gathered around it for photos before we headed back to the farmhouse and got to work. It was incredible to listen to Erin, her humility and the grace with which she treats everyone was inspiring. Her counterpart Jill, shared her role in the operations of the Farm and how they balance and compliment, each other’s strengths. This shift in thinking fascinates me. What could be possible if we focused on our strengths, instead of trying to change our perceived shortcomings? The workshop offered me a chance to explore this, not only expand my skills in the art of natural floral design and work with the most gorgeous flowers I have personally ever laid eyes on. The true gift I was given were the tools, support and an understanding that I was capable of achieving my dreams and defining what success is on my own terms, working with my unique strengths & talents. When I had a chance to chat with Erin, I was a little star struck to be honest despite her kind and approachable manner, here she was, the face and founder of Floret! I have admired Erin and followed along with her blog over the past several years, never thinking that I would ever meet her and Team Floret in person. Erin was such a gracious hosts, taking time to make sure each of us were able to achieve what we envisioned for our time on the farm. She answered questions openly and honestly, gave each of us the gift of her experience and knowledge, invited us behind the scenes all while preserving and protecting the fact that this is her life and family home. Not only did I learn so much from Erin, I got a chance to work with the incredibly talented designers of Team Floret, Sue of Passion Flower Sue, Becca of Becca Blue Flowers, Kailla of Kailla Platt Flowers of and Gretchen of Petals, Ink. to name a few! And all of it was captured on film (dying to see!) by the incredibly talented Heather Payne. Their passion and excitement was exhilarating, they were so kind, so supportive and their talent inspiring! They shared their expertise and some amazing tips and tricks that I’m excited to incorporate into my own work! There were several other established floral designers, who participated in the workshop, I learned just as much from these up and coming designers and was completely inspired by Amy of Gather Design Company , Sarah of Miel Floral Design, Polina of Studio Floretta, Jessica of Zimmerman Events and so many others. One of the girls I sat next to on our very first day was Mary, a lovely Southern gal from Baton Rouge, Louisiana! She was the youngest of our bunch, and we bonded over Anthropolgie (she works there, lucky girl!). We became fast friends and she quickly became the sweetest and funniest girl I know! Mary had me chasing sunsets, adventuring at Deception Pass and laughing the whole time! Her positivity and Southern charm lifted us all up, as we all worked through the emotional shift of the time we spent at Floret and found our flower tribe. I really was able to step out of my comfort zone personally, and as a designer. It was incredible watching Erin carefully select and “thread” each flower into her arrangement. It was so freeing to be able to play with color, and there certainly was no shortage of it! I loved using all the foraged garden elements, like raspberry foliage, docksorrel, and hornbeam, in Erin’s words we really “hornbeamed it up!” She encouraged us to add movement to our arrangements with twinkling accents in order to catch someone's eye, something I’d been doing, yet never slowing down to truly consider each stem. I was so pleased with how my arrangements turned out and yet it was only a few adjustments that made all the difference. I really didn’t have to change my style at all, just look at things with a fresh perspective and work with the strengths I already have as a floral designer. I am already incorporating so much of what I learned on the farm into my growing business, family life and my design work. With three weddings coming up, I am so thrilled to approach them with a few new tools in my belt! Many of our discussions focused on one of the books Floret provided, Strengths Finder 2.0. It has an online quiz that helps you discover your strengths and how to use them effectively. I was so intrigued at discovering my top 5 strengths. Some of them I knew were there, I just truly had no idea how to make them work for me - like empathy. Others came as a surprise - who knew I was so futuristic? I sure see it now! It was such a life changing experience at Floret and I learned so much about myself and I wonder what is possible in my life if I keep focusing on my strengths. Do you know what your talents and strengths are? Are you able to use them to their fullest potential in your own work? What could be possible if you were able to focus on the things that you do really well? I am so excited to find out.